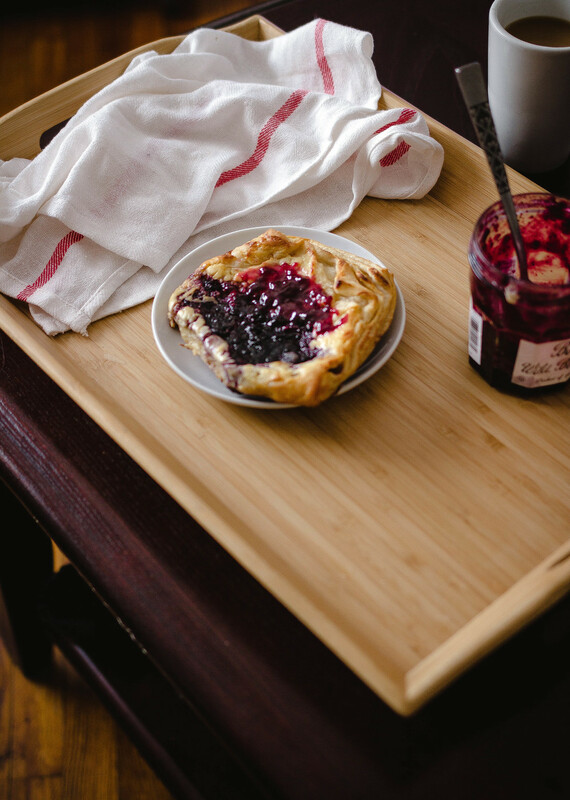 How to Make Your Own Cream Cheese and Berry Danish at Home! We all have them. Fears in the kitchen, I mean. My particular fear had always been to make yeast bread from scratch! A fear that I can glady, yet not so 100% confidently, say that I've conquered in the past year or so. Aside from re-tackling that thing called pasta making someday in the nea--errr.....let's just say, in the distant future for the sake of my own sanity, I somehow had made up my mind during my first ever job that pastry making was only for the big shots. Seeing the patissieres work from the peak hours of the morning when the demand for coffee is high and everyone's a walking zombie, and then admiring their skills of proofing, chilling, folding the dough, then chilling some more, all for a fresh batch of croissants and danishes, sucked every bit of pastry making confidence and vigor out of this young and innocent soul. I mean, all I wanted was to make my own pastry, you know? Is that a sin or something?! Thankfully I still had the fire in there for all these eight years, though. It's been kindled ever so dimly since my first job, that spending time in the kitchen would leave me with no option but to fuel the fire. So what did I do the past week? I finally committed to tackling my favorite dessert next to cake, the beloved danish, once and for all. After looking high and low for the best croissant recipes I decided to go with this one in Fine Cooking. The detailed explanations are way too perfect not to follow. Now, it's important to know that the doughs for croissant and danish pastry are a little bit different from each other. Croissants are typically made with bread flour since it provides a higher rise and slightly more elasticity thanks to the development of gluten. This makes way for a chewier crumb, whereas all-purpose flour, which is used most often in the danish dough, creates a flaky and chewy texture as well, but perhaps not as high in terms of the rise. I went with my favorite current flour combination: roughly about two thirds all-purpose and 1/3 whole wheat pastry ratio. Trust me when I say that pastry making is not all that difficult, guys! Well...that is, if you don't count the fact that mine don't look perfect and I wasn't as patient as I should have been, then it's all good in the hood. The most important ingredients are literally patience, time, good old butter, and preferably a large working space. 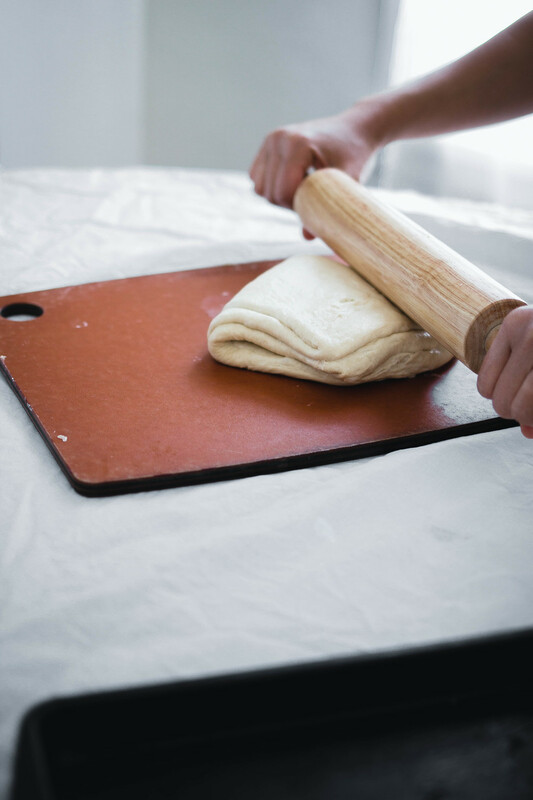 The biggest problem I encountered was using a limited amount of space which made it harder to roll out the dough into long, thin sheets. The thinner you can roll the dough each time you fold, the lighter and flakier the texture will be. You should probably also keep in mind that most pastry recipes call for almost 3 sticks of butter, but I kept it down a notch since 2 sticks of butter never harmed nobody. :) Happy baking and I hope you enjoy! Start preparing the dough the night before baking, or in the early morning so everything is proofed and ready to go in that same evening. In the bowl of a stand mixer or using a regular bowl and a beater, mix the flours, yeast, and salt. With the dough hook attachment and the speed set on low, start adding water, milk, softened butter, and egg. Gradually mix up to a higher speed until the dough becomes slightly sticky but elastic, sprinkling a little more flour if the dough is too wet. Clean up the sides and form the dough into ball. Leave in that same bowl, cover with plastic wrap, and refrigerate for at least 7-8 hours. 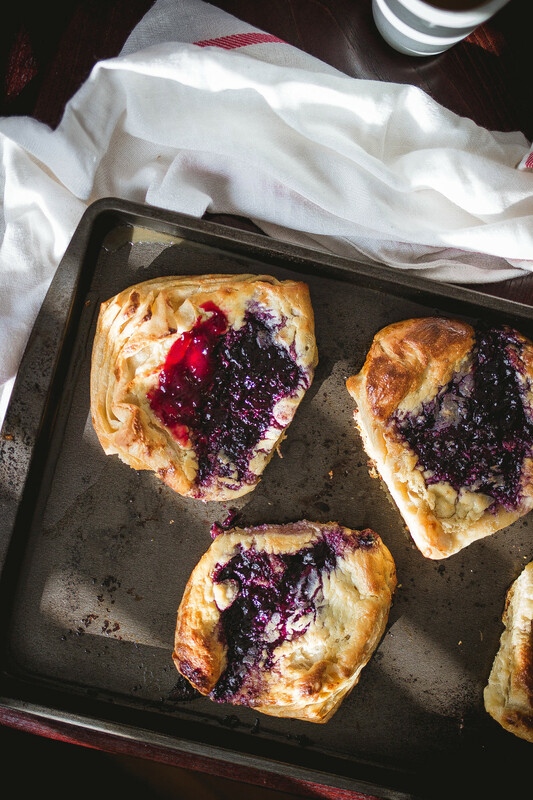 Take the dough out of the fridge about 10 minutes before you're ready to make the danishes. Preheat oven to 375 F. For the super cold butter, place the sticks of butter on a clean and cold board and quickly slice into thin layers, preferably 10 layers each stick (as shown in picture). 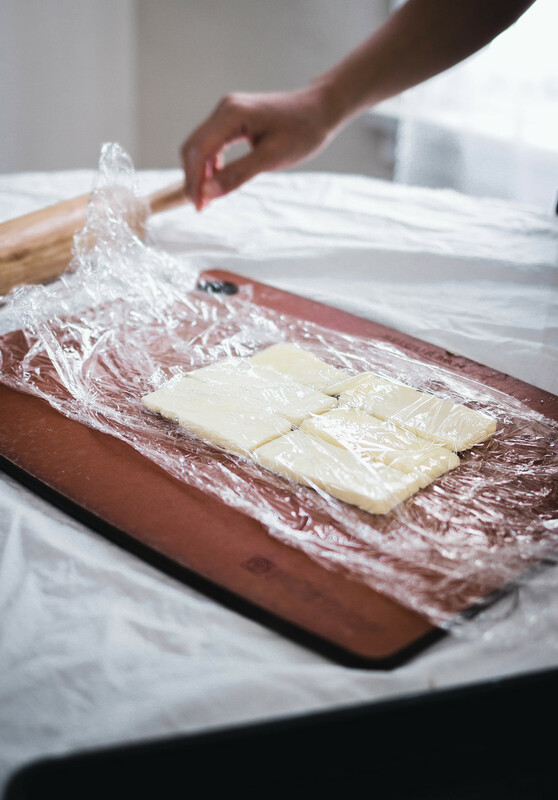 Place one third of those butter layers side-to-side, cover the top with plastic wrap or parchment paper and firmly roll it into a uniform sheet/thin block with the rolling pin so it can cover the surface of the dough we're about to work on. Set aside in cool area. Repeat the same thing with the other two thirds of butter so you end up with three sheets of "large" butter. Flour a large and clean surface and begin to roll only one third of the dough with a rolling pin as thin as you can (probably about 1/8 of an inch thickness). Place one of the butter sheets on one side of the dough and fold the dough like a book. Roll it out into a rectangle about 1/2 inch in thickness. Fold the long side in half once again and firmly roll it into about 1/2 inch. One more time, fold it into a smaller rectangle and firmly roll it out into about a bit thicker than 1/2 inch. Cut into desired sizes, big enough to easily pinch all the sides of the danish and fill with 1 tbsp of jam and cream cheese filling. Repeat the same steps with the two remaining sheets of cold butter and balls of dough. Place the small pastries doughs on a lightly greased (or lined) cookie sheet that has sides (so butter doesn't drip to bottom of the oven), leaving about 2 inches of space between the doughs. Then gently tug at the edges of each dough and pinch them up and inward so as to make a slight well in the middle. Beat all the filling ingredients minus the jam until creamy. Spoon a bit of filling inside the well, spoon a little jam, and brush the doughy part of the pastry with whisked egg yolk & water. Bake for approximately 22 minutes or until tops are golden filling is baked. For storing them, let them cool and place in airtight container in the fridge. Let them sit out for an hour or simply heat them before eating.